Michael Wadman has posted a few photos of former Plymouth Citybus Dodges working for other operators after leaving Plymouth. 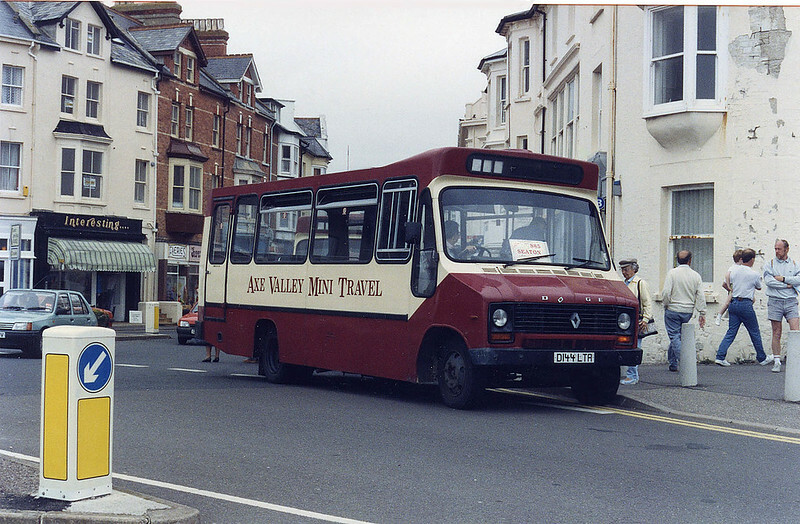 D144LTA is seen here on the 5th August 1992 with Axe Valley. Its amazing to think that this was over twenty years ago! It really doesn't seem that long ago that Plymouth was awash with these things! It is also interesting how things seem to go in cycles. When these things were new they replaced a lot of decent sized buses. Double deckers were on their way out along with the last of the Leyland Nationals. Plymouth was heading towards being a bread van city. Then slowly the Dennis Darts started to arrive and eventually start replacing the breadvans and now Plymouth Citybus is not only getting more double deckers its even buying brand new ones and the minibuses have long gone. When you look back the minibus interlude was quite a short period really from about 1986 through to about 1993 when the Dennis Darts started to take over. Virtually all PCB routes were run by these Dodge minibuses only really the old 18/19 to Honicknowle and Brake Farm, the 20, 36/37/46/47 city circulars and 50 were largely exempt from these vehicles. There must be one of these beasts around to preserve for our transport heritage!